There is a popular song hit by the name “Everything I Touch Turns To Gold” by English pop group Saint Etienne that can be attributed to Sri Lanka’s new head coach Chandika Hathurusingha who on his first assignment has changed the fortunes of the national team across all three formats – Tests, One-Day Internationals and T20 Internationals. Not so long ago this very same team was struggling to compete with other nations at international level and the cricket they played had reached a point of no return. Hathurusingha is renowned for uplifting Bangladesh as an international cricket nation during his four-year tenure as coach and now he is beginning to do the same with the Sri Lanka team guiding them to a successful tour of Bangladesh where they won the Test and T20I series and emerged champions of the one-day tri-series that featured Bangladesh and Zimbabwe. The DAILY NEWS caught up with Hathurusingha after the team returned from their triumphant tour of Bangladesh to get to know the intricacies of how the coach works with the players to form a winning combination and what the future looks like for the country’s cricket. Q: Are you surprised by the results obtained in Bangladesh? CH: Not surprised by the results but surprised by the improvement we showed in a short space of time. I was surprised by the way we played and the dominance that we showed there. I expected to win but I also expected a lot more fight from Bangladesh especially in the ODIs and Tests. Q: Do you believe in the old adage that the coach is only as good as the players? CH: The coach is only as good as the players because you can’t go and bat and bowl for them I certainly believe in that. Then again if you don’t utilise what you have then you can under achieve as well. Q: You are credited with preparing players mentally and working on mental toughness, how much of that have you been doing with the Sri Lanka team? CH: Preparing mentally I don’t know what I am doing you must ask the players. We try to be realistic, identify what our strengths are, the opportunities against that particular opponent and the conditions of the particular day and try to maximise every bit of talent we have. That’s what I am trying to do and probably get the players to understand their strengths and limitations. Q: Can you elaborate on the sudden changes that have been brought about in the games of Thisara Perera and Kusal Mendis? CH: For both of them I saw immense potential. For example Thisara was never given the particular role that suited him in the past because of that he probably didn’t realise how good he can be. But at the same time he has the second highest Man of the Match awards after another player in Sri Lanka. So that means there is something special in him to change the course of the game which I saw from outside before I came. He is a big part of our plans going forward. I spoke to him of what he can be and what he can do and how good he can be. Then myself, Rumesh (Ratnayake) and Thilan (Samaraweera) put him in a kind of a situation that he is challenged every time he comes to training, more than before. He did train differently in the last few months. In the case of Kusal Mendis he had lost confidence in himself and a little bit of faith in his ability. It is natural for a young player to have success and a little bit of dip which I have experienced with some other players in other countries where I was coaching. Everyone can have that kind of dip but it’s nothing to be worried about. You have to trust your ability. I felt that a lot of information has been fed to him that has made him lose his way of playing and his actual strength. We had to clear his mind and identify his strengths. Q: Was it a gamble you took giving an ODI cap to Shehan Madushanka (Tri-series final v Bangladesh) and a Test cap to Akila Dananjaya (2nd Test v Bangladesh)? CH: I don’t take it as a gamble but I saw something special. I foresaw what they can do given the right role and environment. I believe that throwing talented players into the deep end is the best way to get them playing international cricket. When you put trust on them and if they are talented they will give you results. I spoke to Shehan and told him clearly what I wanted him to do and what he is capable of doing. Just go and do it without worrying about the outcome. Even Akila I thought he was a very good Test player although he was playing only one-day cricket. You have to play them in the right conditions. The conditions in which they played suited both of them. 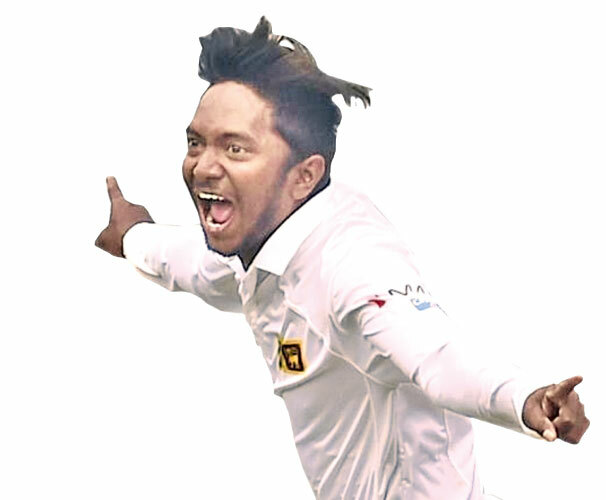 Q: How do you rate Akila Dananjaya as a Test bowler? CH: He reminds me of young Murali because his off-spin is ideal for Test cricket, the loop, the speed that he bowls and the lines he bowls are for Test cricket. He can bowl a few other balls as well. I am not saying that he is going to play in every Test match going forward but whenever we think we need someone to suit the conditions we know that we have someone special. Q: What do you bring to the table that other coaches don’t? CH: I don’t know to be honest. I believe if you do what other people are doing you’ll never be the best. You have to be really creative and be the leader of whatever you do that’s what I believe. We can’t copy other coaches from other countries. If you do that you can’t be competitive you’ll always become second. If you want to be the best you have to be unique. I try to think differently and work on what I have and maximise it. Q: How did you manage to change the fortunes of a team that has been struggling in international cricket so quickly? CH: For instance Bangladesh played the same team and dominated international cricket domestically for the past 3½ years and we beat the same team. I think I read the game and the situation and I am probably blessed with that talent. I don’t know. We did positional changes that is one thing. For example Kusal Mendis to open the batting and Dushmantha Chameera to bowl with the white new ball. My analyst showed me that he had played 9 matches and taken only one wicket in ODI cricket previously. I was surprised for someone like him taking one wicket in 9 games there was something wrong somewhere. We had to change it. There were also positional changes and there is a lot of tactical things involved which I don’t want to divulge. Q: Do you set challenges or any goals to the team? CH: Playing international cricket is a challenge itself. You are expected to win games. The challenge comes with playing for your country at the highest level. You have to play to win and find ways to do that. Q: What does the team need to move forward? CH: We have a lot of areas we can still improve one thing is we need to believe that we are good enough and the confidence. We have a lot of injuries and we need to manage that, it is something to address. From last month or so we have changed the ways we trained that is going to help us to maximise our potential and help us to win all the time.